Outgoing Virginia Gov. Terry McAuliffe touted his record on economic development Wednesday in his final annual address to state lawmakers, yet said his proudest achievement was restoring voting and other civil rights to thousands of felons who had finished their sentences. The "State of the Commonwealth" address was a chance for the upbeat Democratic governor, who is often mentioned as a potential presidential candidate, to highlight what he considered his accomplishments and to offer advice for Virginia's path forward. On Saturday, the term-limited McAuliffe turns the office over to fellow Democrat Ralph Northam. "Virginia is a different place than it was four years ago, and for that we should all be proud," McAuliffe told the joint assembly of lawmakers in the State Capitol. "But there is still more work to be done." The governor used the speech to announce that a manufacturing company plans an expansion in Prince George County. With that project, McAuliffe said, Virginia has now attracted more than $20 billion in new capital investment since he took office. That's a figure that exceeds any previous governor by more than $6.5 billion dollars, he said. That figure accounts for announced deals, but not all projects have been completed and some have been languishing for years. McAuliffe also touched on his work on transportation, education, gun control and host of other issues. But it was the restoration of civil rights to felons - "ending more than 100 years of disenfranchisement and racial discrimination'' - that he said was his "proudest moment." McAuliffe tried to restore rights to more than 200,000 felons with an executive order, but Republicans successfully challenged him in the state Supreme Court. He then proceeded to sign restoration orders on an individual basis. So far, McAuliffe said he has restored the rights of more than 173,000 Virginians. "Witnessing the bigotry and violence" during a white nationalist rally in Charlottesville last summer was the "lowest" point of his tenure, McAuliffe said. Hundreds of white nationalists descended on Charlottesville on Aug. 12 for a rally planned in part to protest the city's decision to remove a Confederate monument. The event descended into chaos when clashes broke out between attendees and counterdemonstrators. A Charlottesville woman, Heather Heyer, was killed when a car plowed into a crowd of people who were protesting the white nationalists. Later, two state troopers monitoring the event from the air died when their helicopter crashed. Heyer's mother and stepfather, Susan and Kim Bro, were in the audience, as was Trooper-Pilot Berke Bates' wife and Lt. Jay Cullen's wife and son. As for the road ahead, McAuliffe said the legislature should "put the politics aside'' and expand Medicaid, something he's fought with the GOP-controlled General Assembly over for four years. He also urged lawmakers to avoid socially divisive legislation, citing the record 120 bills he vetoed while in office. Del. Benjamin Cline and Sen. A. Benton "Ben" Chafin offered a GOP perspective after McAuliffe's remarks. 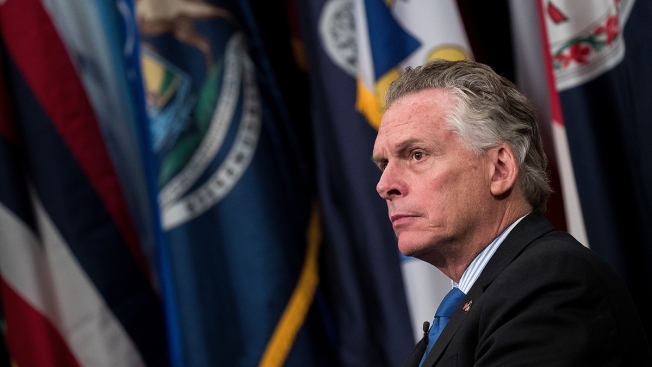 Republicans contend that Virginia's economic picture is not as rosy as McAuliffe portrays it. "While our neighbors in North Carolina and Tennessee have been aggressively improving their tax climates to attract businesses and grow their economies, Virginia has effectively been standing still,'' Cline said, according to prepared remarks for later broadcast.